This post is part of a social shopper marketing insight campaign withPollinate Media Group™ andBarilla, but all my opinions are my own. #pmedia #pastanight https://cmp.ly/3/8vNxcO. I don't know about your house, but at my house we have already hit that busy time of year. There seem to be things going on every weekend and on top of that we have our usual busy weeknights. Getting something healthy on the table seems to get more challenging, but with all the sweets and treats this time of year, it is even more important. If you struggle with getting something healthy on the table quickly, I've got a flexible and healthy pasta recipe for you today. This recipe is also fantastic because it is a one pot dinner. I love it when I can get some veggies in my kids, everyone likes it and the kitchen doesn't look like a disaster when I am done. Win, win, win! The other day, I ran into my local Martin's grocery store looking for something I ran out of. While I was there, I needed to figure out a quick and healthy dinner for the family. I prefer foods that I recognized or know what all of the ingredients are, so sometimes coming up with a quick dinner is a challenge because I'm not serving my family processed foods. 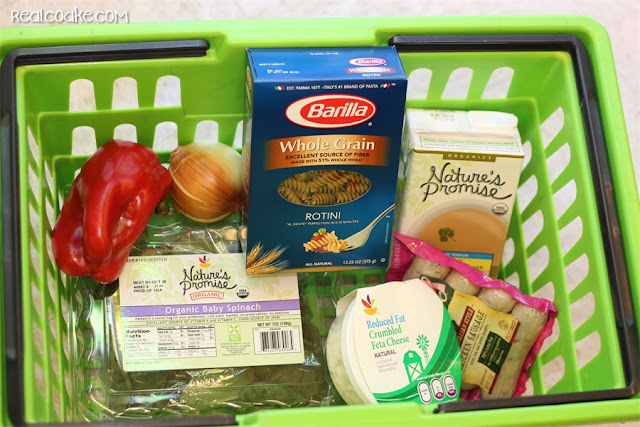 I saw the Barilla Whole Grain Rotini and know my family always loves pasta. I think pasta is also a great meal in which to sneak veggies and other healthy things. I threw a few other goodies into my basket and headed home to make a quick and healthy dinner. I find that it is easiest to do all my prep work before I start that actual cooking. Then it is all done and I am ready to focus on the cooking. I also think my new colored knives make cooking more fun, silly but true. 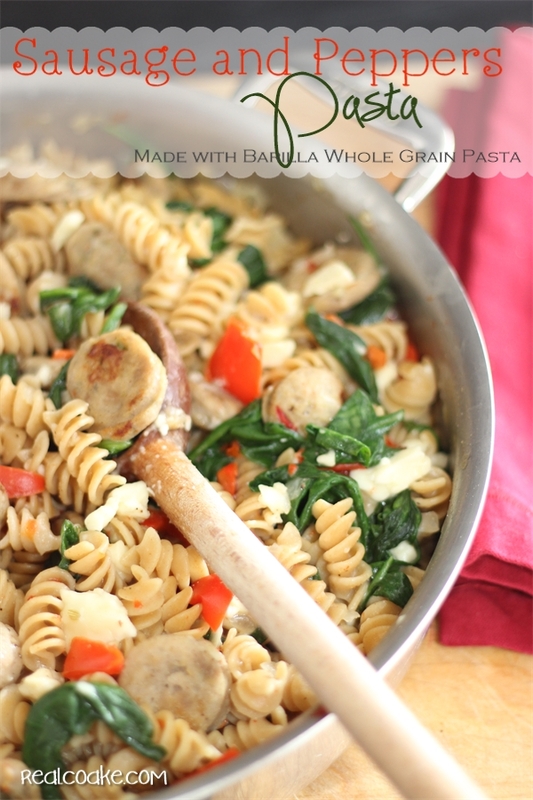 The Sausage and Peppers Pasta with Barilla Whole Grain Rotini is a super flexible recipe. I have a printable version for you at the bottom of the post. If your family doesn't like red peppers, you can add zucchini or broccoli or peas. Whatever veggies your family likes can go in this pasta. Just swap out about like amounts for things your family will go for. Same goes for the cheese. If you don't like Feta, just use Parmesan or some other cheese you like. I think it is most important to use a sausage you really like. 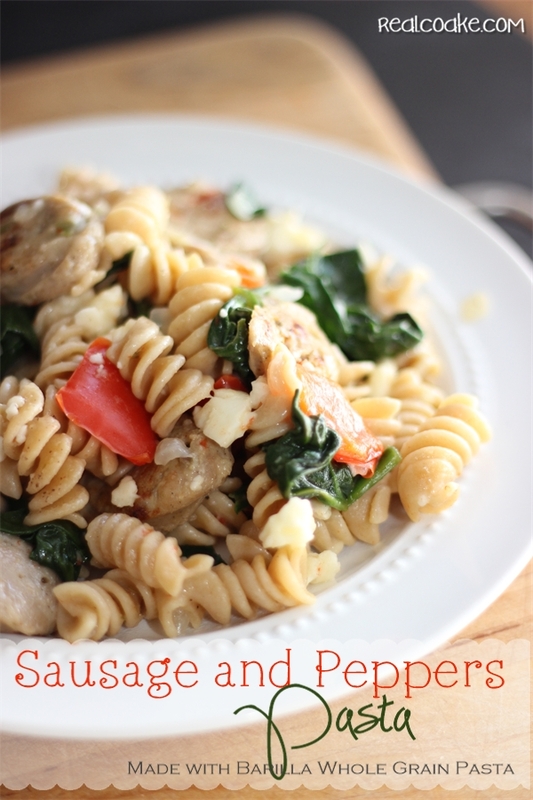 We usually cook with chicken or turkey sausage as they are bit better for you. 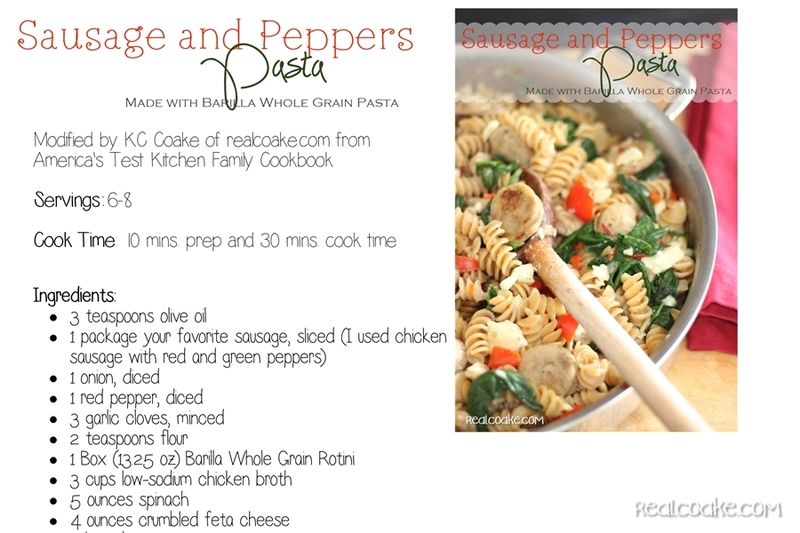 We always cook with Whole Grain Pasta, it is just another way to add some more nutrients into our diet and is a better for you pasta. Yummy! 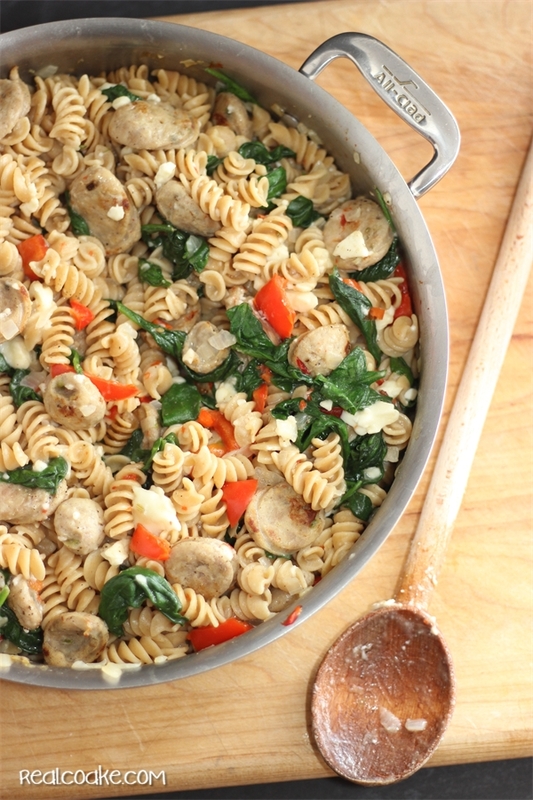 Dinner was ready in no time, all in one pot and with whole, fresh, better for you ingredients. I can't say that my kids eat every single veggie on their plate. Sure I find some pushed to the side, but I know they get veggies this way and more than they would if I just served them a plate of spinach or peppers. Like I said, we find pasta a great meal to sneak veggies into.
. Please remember that this recipe is really flexible. just use the instructions as a guide for how to cook the meal and get it done in one pot, but know that you can trade out ingredients in like sizes and make a meal tailored to your family. You can also make this meal many times and vary the ingredients, so it will look like you have a bunch of new recipes! Yum! You can learn more about the Barilla Better for You Pastas on their Facebook page. 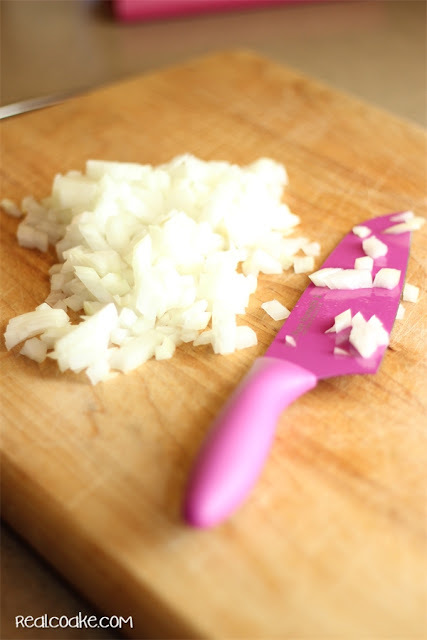 What are your secrets to getting a quick and healthy meal on the table that the whole family will eat? I can't wait to hear (and learn some new tricks)! 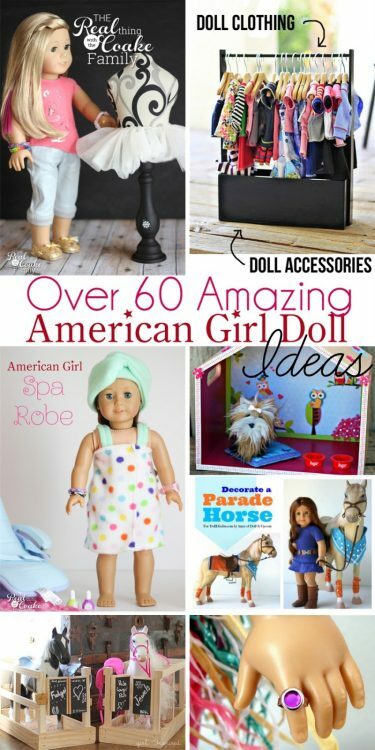 I link up with these great link parties and at Between Naps on the Porch and Savvy Southern Style. Thanks, Mom! I’ll see what I can do when you come visit next week! This looks like a great dinner! I love easy healthy and quick meals and this one sure fits the bill! I’m hopping over from Tutorials and Tips party (my link up was # 24) Thanks for sharing this meal with all of us! It was a yummy dinner! Yes, healthy and quick meals are the corner of our weeknights. So glad you like the recipe! Hope you enjoy it.